Emergency services are at the scene of a ‘serious road traffic collision’ between a car and a motorcycle in Hastings, police have confirmed. Police said they were called to the incident on the A259 Old London Road at 3.30pm on Sunday (March 26). A police spokesman said: “We were called to a serious collision between a car and a motorcycle. “It is believed that the rider of the motorcycle has suffered serious injuries. “The air ambulance service was called and we believe they are still on scene. 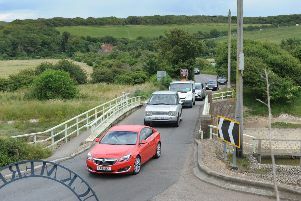 “A full road closure of that part of the A259 is in place and is likely to be closed for some time. Police said they have been supported by crews from the air ambulance and South East Coast Ambulance Service.